Who doesn’t love a title that includes “muffin tops”? Don’t worry, these are for eating, not for squeezing into your jeans. And ACTUALLY, they’re (slightly) healthy. Fruit, whole wheat flour, Greek yogurt. Nutritious for sure. I made these last week after a borderline heart attack incident that could only be solved by a little time with my oven. I took the adorable little 6 year old that I babysit fairly frequently to a park down the street from his house. We packed up nets and buckets and cups (along with a small bag of raw chicken as bait) to do a little crayfishing. I had a folding chair set up on the side of the stream, as I was in charge of watching the crayfish that he caught to make sure none escaped from the bucket. A bunch of kids came over to watch and eventually join, and pretty soon we had a stream full of fishing kids and a bucket full of enough crayfish for me to make a decent dinner out of, assuming I knew how to cook crayfish (I don’t). All in all, it was a hunky dory afternoon. THEN, as I was innocently instagramming this picture of cute little Mas and his first crayfish, I happened to glance down. At my feet was a HUGE, and I mean HUGE snake. At least four feet long. Thick, black with green stripes. Casually slithering by me, a mere inch or two from my toes. I jumped up onto the precariously perched fold out chair and began screaming at the top of my lungs, as any sane woman would. All the mothers of the other kids saw me, then the snake, then their kids in the water that the snake was quickly approaching, and started screaming as well. It was probably the kind of incident that people would giggle at if captured on video and shown on a vintage episode of AFV. Living it? Not funny. At all. I snatched my little charge from the water and told him we were going to the pool (suuuuper swanky country club that they are members at) where I was sure there would be no snakes or otherwise creepy water creatures to be found. Then I got in my car and jumped at the sight of my AUX cord, which also happens to be long and black. Jitterssss. The moral of the story is, baked goods fix everything. Mix flours, brown sugar, baking powder and soda, salt and cinnamon. Toss the peaches with a little bit of brown sugar and cinnamon (I didn’t measure these, probably 1 tbs brown sugar and 1/4 tsp cinnamon). Place on a baking sheet or in a pan and roast at 425 for 10-12 minutes or until slightly caramelized and syrup-y. Set aside to cool. Add the oil, yogurt, milk and vanilla to the dry ingredients. Combine until you have a sticky batter. Strain the peaches, reserving the liquid. 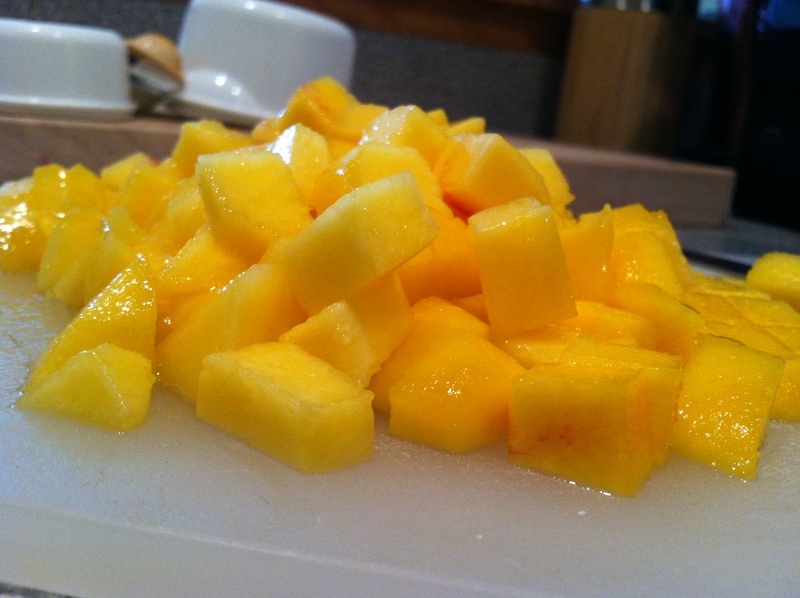 Fold the peaches into the batter. Using a cookie scoop, evenly place the batter onto a greased or lined cookie sheet. 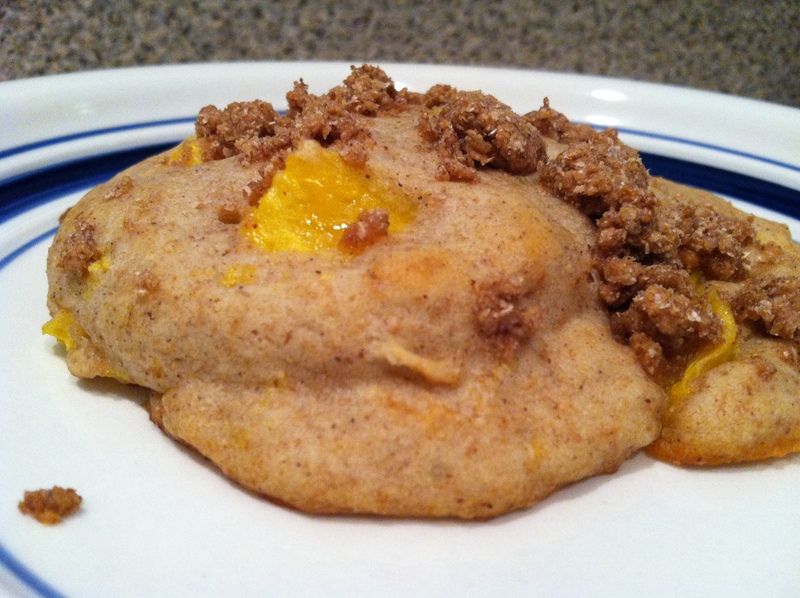 Mix 2 tablespoons whole wheat flour, 1 tablespoon brown sugar, 1/2 tsp cinnamon and 1-2 tbs of the peach liquid. It should stick together but be crumbly. Sprinkle over the raw muffin tops. Bake at 425 for 7-8 minutes, then lower the heat to 350 and cook for another 7-8 minutes or until a toothpick comes out clean. These look like kind of ugly cookies, but they have the texture of the perfect muffin top. 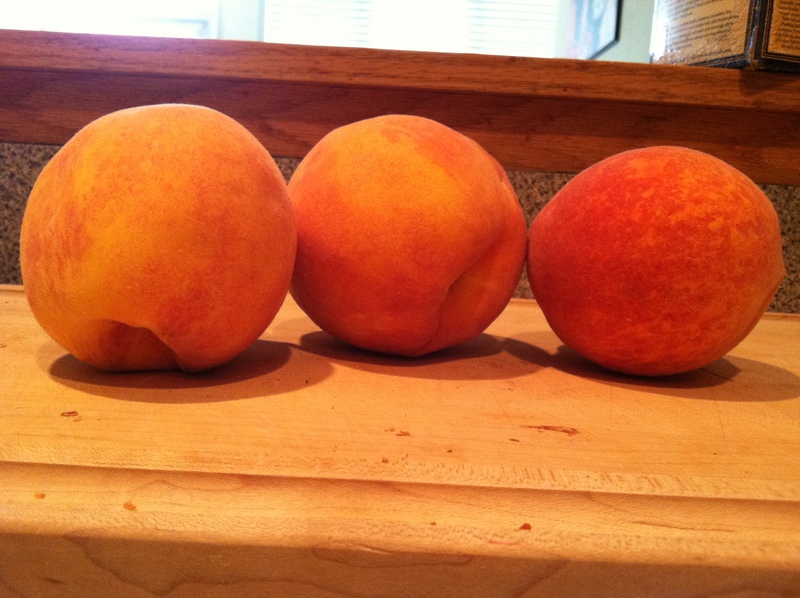 The batter isn’t overly sweet, but then when you get a peach it’s nice and sugary from the roasting. 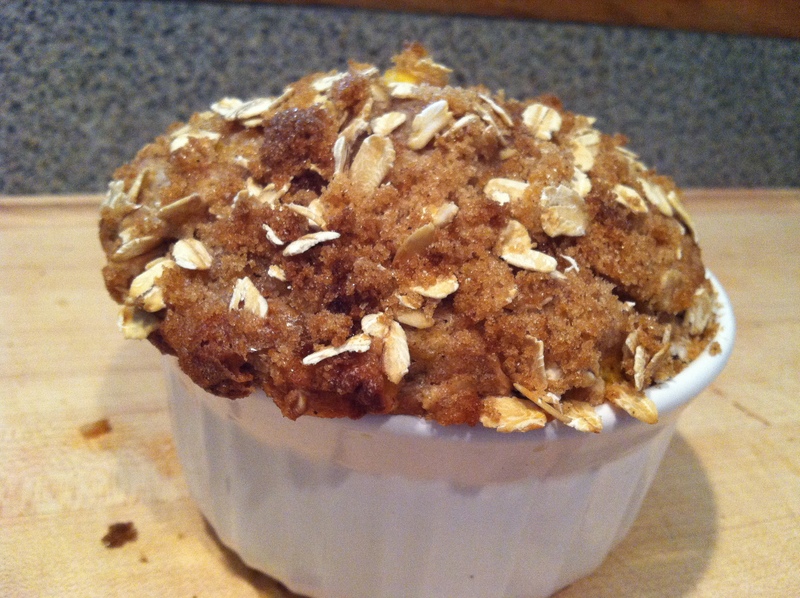 I also had extra batter so I baked it off in a ramekin at 350 for about a half hour, sprinkled with brown sugar, oatmeal and cinnamon. This is also a good option for the recipe. Mini cakes? Breakfast cake? Do it. Oh, and near death experience entitles you to eat them all without sharing. Kudos to my survival, right?